News of the closing of over a hundred J.C. Penney stores, as well as a distribution center in Lakeland , doesn't surprise anyone who has been paying attention to the trend: brick and mortar stores are shuttering in the era of online shopping. J.C. Penny joins other department stores, like Macy's, who are shrinking amid challenges in the sales industry. But there are a few notable exceptions, like small, independently-owned neighborhood stores which are finding a niche with people looking for a personal shopping experience, and interested in helping their local economy. 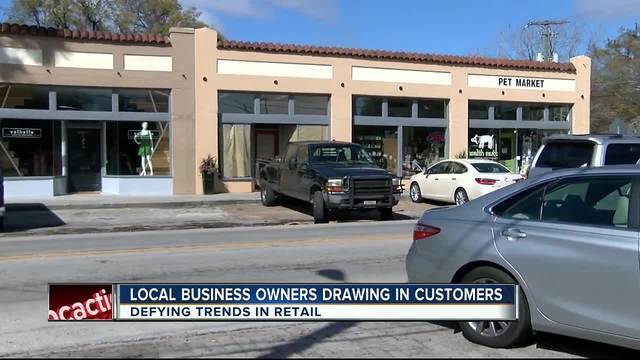 Among them are two neighboring stores in Seminole Heights in Tampa which are bucking the online shopping trend. Health Mutt , a boutique pet shop, is in the process of expanding their brick and mortar location along Central Avenue in Tampa, and right next door a new store is opening up called Valhalla, which offers a kind of membership program for local residents to rent good quality clothes from an ever-changing "neighborhood closet." Both owners credit their unique but affordable offerings for their venture into an actual store-front, and hope the neighborhood has enough interest in supporting them. "I stayed flexible with the business. And really tried to listen to customers about their needs and kind of evolve my business as I see fit," explains owner Kendra Conze, who opened Health Mutt about 5 years ago. "We're not a big box and we don't want to pretend like we are or look like one," adds Conze. "A large part of the expansion is just improving the esthetic of the store." Health Mutt is swallowing up the empty store front next door, formerly a bakery, adding about 1100 square feet in the process. Conze admits that expanding, when many other retailers are shrinking, is a risk, but it's one she believes will pay off because of the loyal customers. "We're family-owned, it's only one location, we didn't buy it from anyone," says Conze. "I think people appreciate that and value that. Putting money back into the local economy is so important and I feel like a lot of people [who shop here] recognize the value in that." Next door is a brand new store that doesn't yet have a loyal customer base. Valhalla opened last week with a dream Danielle Ferrari had of helping women make better use of their rarely-worn clothes. The idea of a membership club for clothes isn't new, but what is different about Valhalla, says Ferrari, is the store front. "I'm the only one, I think in the world, that has one that is in a brick and mortar. The rest are all online," says Ferrari, adding "we'll see how it works!" For $39 per month membership members can borrow three clothing items at a time, and exchange them as many times as they want. She also offers one-time rentals, and also has clothes for purchase. "Women own so many clothes that we don't wear. So I thought why do we do this and what can I do to change it," says Ferrari, who adds that the clothes in the shop will change as the client-base grows. She believes shoppers still want good customer service and the ability to try clothes on before purchasing, two luxuries not afforded through online shopping.